the birthday banner that will become a tradition each year. 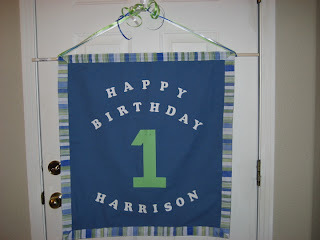 (the number one is just cut out of paper and pinned on - easy to change with each birthday). 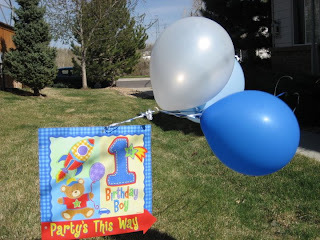 i think my in-laws thought i was joking when i told them that the birthday banner will fly high during the week of my son's birth (and that he will dine on the traditional "you are special" plate)...for the rest of his life! 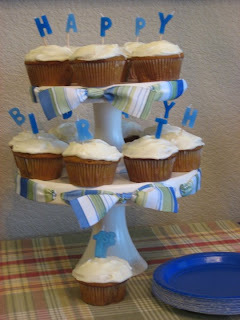 are these birthday practices not known to the entire world? is it just a bartlesville thing? 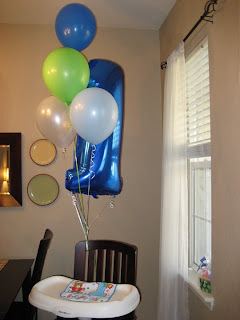 the balloons...which are now floating on my ceiling. and the highchair...which was cleaned to a spotless shine before the party. pumpkin cupcakes with cream cheese frosting. to die for. and, yes, i was trying to sneak vegetables into my son's first sweet treat. jessica seinfeld would be so proud. 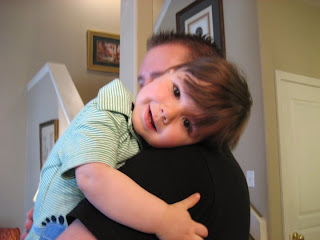 SO happy to see uncle zach. I hope part two has the pics with frosting all over him!!!! That is my favorite tradition. We have the plate, but not the banner - very cute!!! I did not even use the plate this year, though. Sarah's is the last birthday, and it is tomorrow. Now I don't feel like she should get to use it either, since no one else did!!! We have a plate...we always forget to use it. All I can say is...WOW! He's adorable! And everything is so "domestic guru" in your pictures! Rachel, I have found you! What an adorable family. It has been way too long. Lauren graduates in a few day and is off to Texas A&M and Chandler will go to high school. Your little man is gorgeous.